The risk-limiting audit was for the Republican U.S. Senate primary results in the city of Fairfax, and was a demonstration of what could be done statewide in future elections. FAIRFAX, Va. — In a first for Virginia, elections officials gathered Thursday and Friday at the Fairfax County Courthouse to prove that election results from June’s primary were correct. The risk-limiting audit was for the Republican U.S. Senate primary results in the city of Fairfax. It was a demonstration of what could be done statewide in future elections as a statistical check to provide more evidence that the final results based on counts from ballot scanners are correct. The audits, when done for an entire election, are meant to show statistical confidence that the winner really won and the loser or losers really lost. Results of the first audit completed Friday showed the results of 69 randomly selected ballots scanned by a machine Thursday matched the hand count of those same ballots done Friday morning. (One ballot was selected twice by the random process). There were two changes noted: One vote shifted from E.W. Jackson to Nick Freitas, and one vote shifted from Freitas to Jackson. Elections officials believe that the vote outcomes were not changed, but that the ballots were reshuffled in the stack, and were not properly matched up. One extra ballot was found stuck to another ballot, but it had no impact, because the voter left it blank. Because of the sample size and confirmation of the matchup between the scanned ballots and hand-counted ballots, statistical modeling gives a 97 percent confidence that the initial scanning was correct. A second audit of 300 ballots, which included some duplicates selected twice through the random process, was checked using a different method Friday afternoon. That ballot polling audit did not provide enough of a margin to provide strong evidence about the exact result, due to the extremely small number of ballots cast in the city of Fairfax during this election. However, the hand count audit results did essentially match up with the actual results of Thursday’s ballot scans. On Thursday, the ballots were signed out of the secure room where they are kept following an election and grouped into small batches. Rolls of multisided dice, by people whose names were drawn randomly, were then entered into a computer program as a random seed to generate a decision on exactly which ballots from each batch would be randomly checked by hand on Friday (The first rolls were 7, 8 and 2). The random nature of the selection allows for an extremely small number of ballots to represent the expected outcome for an entire election. In a statewide audit of this kind, it could require fewer than 1,000 ballots to be checked, depending on the margin of victory, type of audit and accepted risk. Elections officials determine the number of ballots to randomly select based on statistical models tied to those factors and which type of audit is conducted. If a potential red flag is found, a second round of the audit is conducted to be sure it was not a false positive caused by human error. Several elections leaders attending Friday’s session expressed concern about the reaction if a mistake were made in the first round of the audit, creating a false positive. Virginia Commissioner of Elections Chris Piper, though, likened it to a doctor seeing a potential sign of concern or something inconclusive and then following up to confirm whether everything is OK or the person is actually sick. Fairfax County Electoral Board Secretary Kate Hanley said the most important thing is that the process will be set up in advance, so the audits will be done even if there are no signs of any problems. Under Virginia’s current plans, however, the audits would initially be done after the vote is certified, which means they could not change the official results of the election or provide a path to an election do-over. Eventually, Piper hopes to have the audits done before votes are certified, but the state and local elections officials must first figure out how the audits will work in Virginia, including which state or local elections would be checked in a given year. Virginia is set to decide in next few months how to have local electoral boards implement the audits in future elections on a rotating basis across the state’s jurisdictions. So dozens of elections officials and experts from around the state and other parts of the country were at the courthouse observing the pilot proceedings. A hand recount of all ballots would not be practical, effective or necessarily accurate. So under current law, Virginia is supposed to do some type of similar audit starting next year. However, the need to improve efficiency, cost and speed could lead to a legislative change to give the Department of Elections and local elections officials more time to get the process right, correct potential contradictions in the law as written, or allow for more flexibility. “This is absolutely critical to Virginia elections,” Piper said. He described the two audits to be completed Friday as an important first step. The hand count; the separate comparison of a hand count to how the scanning machines counted specific ballots; or the third tested option of selecting a larger batch of ballots to check can also incidentally identify instances in which a hand count or recount of a race might identify who the voter meant to support, but the scanner did not. Those situations include cases where voters did not fill in the bubble next to a candidate’s name, but instead may have circled the name or made other indications on the ballot. 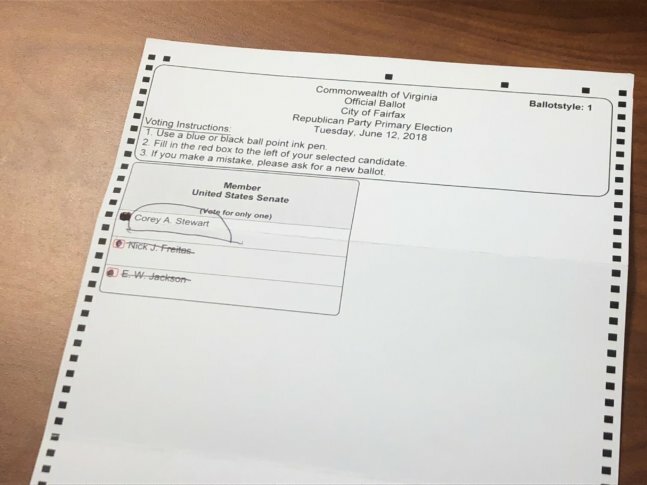 Ballots that elections officers saw Friday included ones with stray marks, a check mark for a candidate, and one where a voter filled in the bubble next to all three candidates before drawing a line through the names of E.W. Jackson and Del. Nick Freitas and circling Prince William County Board Chairman Corey Stewart’s name. That ballot would likely be counted for Stewart in a hand count or recount, but not by a ballot scanner on Election Night. Colorado has tested similar audits after significant trials, and some other states require less-scientific checks of a certain number of ballots cast in each election. Colorado’s process has changed several times since first implementing the audits. Prince William County had also sought to be the test case for Virginia under a new law that went into effect July 1, but the Department of Elections chose the smaller city of Fairfax instead. The audits are not recounts and cannot change the outcome of a race on their own, but could provide evidence to trigger a recount if any issues are found and laws are changed to allow that.